Two more CDs containing works by McCabe have already been issued in 2013, to add to the flood of CDs which came out last year. 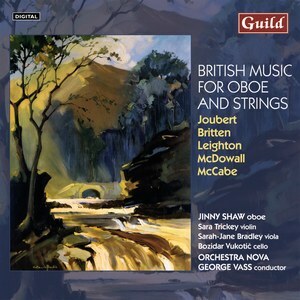 Guild GMCD 7383, a recording of British music for oboe and strings, offers McCabe's Oboe Concerto, along with works by Joubert, Leighton, and McDowall. Jinny Shaw is the very fine oboist, and the Orchestra Nova is conducted by George Vass. 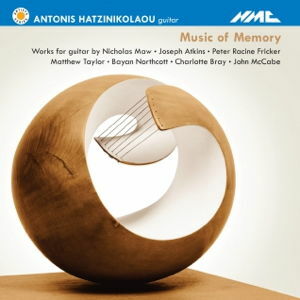 Meanwhile NMC have issued a CD of guitar music entitled 'Music of Memory' NMC D184, with the outstanding Greek guitarist Antonis Hatzinikolaou. Along with McCabe's Canto for Guitar, this also presents works by Nicholas Maw, Joseph Atkins, Peter Racine Fricker, Matthew Taylor, Charlotte Bray and Bayan Northcott. With the rush of recordings which came out in 2012, on Dutton, Guild, NMC, Naxos and Quartz, for which details may be seen elsewhere in the News section, hopefully these two further CDs will be auguries of more good things to come in time for 2014, McCabe's 75th birthday year.